Today was a long day of birding Long Island’s barrier beaches and lots of time in the field finally paid off some time after 3 PM. Seth Ausubel, who you probably will recall from quite a few birding outings described on this blog, and I were at what we had already agreed would be our last birding stop of the day, Edgemere Preserve. This former landfill in southeasternmost Queens has become one of my favorite places to bird lately and it did not disappoint. Seth stepped off the gravel road that goes over the top of the capped landfill and a bird immediately flushed from the bushes. I yelled “kingbird” because it clearly was one but for some reason my brain refused to accept that it was yellow underneath as I desperately sought to force it into the Eastern Kingbird box. Its tail was wrong too, with white edges to the outer part of the tail instead of the white-tipped tail of Tyrannus tyrannus. That is because it was Tyrannus verticalus, known to most birders as a Western Kingbird, a realization that came to both Seth and me as we watched it fly several hundred yards up and to our southeast until we were pretty sure it landed at the edge of the preserve. Such a bird needed to be refound! Sadly, when we got to where we estimated it had landed we found instead a Peregrine Falcon and a couple of American Kestrels. If the kingbird had actually landed there it was not going to stick around to hang out with that crowd. Despite our inability to refind our bird we went back over the encounter and remained convinced that we had a Western Kingbird. Finally, my 300th bird in Queens! 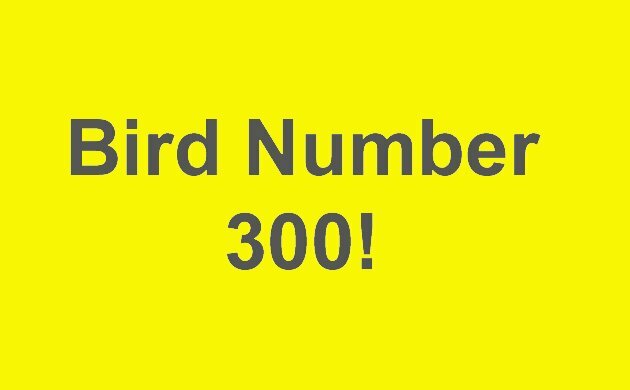 This brings us to the second point of this blog post, which is to announce the winner of The Warbler Guide, which Princeton University Press graciously agreed to send to the person who correctly guessed what my 300th bird in Queens would be. The problem is that no one guessed Western Kingbird. No problem! This is where having a cute three-year-old comes in handy. I wrote the names of everyone who took a guess on pieces of paper and put them in a hat. The result is below. Thanks to everyone who took part and especially to Princeton University Press for providing a copy of the absolutely outstanding The Warbler Guide. Now I wonder what bird number 400 will be? You are a silly man, Corey: you must be the first North American birder ever to string a vagrant Yellow Wagtail into a “Western Kingbird”. That’s the second time you mess up the ID of a European vagrant I sent over to you: first the Black Kite you called a “Turkey Vulture” over Queens, and now this. No wonder the Bearded Vulture turned back halfway across the Atlantic. Oh please. You still haven’t found the Blackburnian Warblers nesting in your backyard and you criticize me? Are you sure it wasn’t a Tropical Kingbird? They’re pretty vagrant in the fall, could show up all over the place. And they’re hard to tell apart from Western. Seeing as we caught the white outer tail, didn’t note a big bill, and that Western Kingbird are seen on the coast of Long Island often enough to not be a review species in downstate New York whereas Tropical Kingbird has yet to be reported in New York, yes. The thing that worries me most about moving back to New York is that I will probably end up in Queens and I will never catch up. Don’t worry, Carrie. I’ll help you catch up. Now move back to New York! HUZZAH! Thank you Corey and your adorable youngster! Please tell Desi thank you from me, and that he will get the biggest high five of his young live if our paths ever cross. Wait a minute, is that the set he promised Desi BEFORE the draw?!? Desi is not prepared for narrow gauge railroading. And no one better tell him that it exists because he has enough Thomas stuff already…so, Nick, I guess you’re off the hook.